The Cape Breton German Shepherd Dog Club. 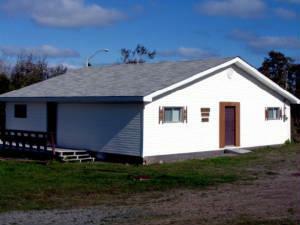 On this home page, you can see our club building on Centerville Road in Gardiner Mines, Cape Breton, Nova Scotia. Choose one of the buttons on the left to find out more about us. Obedience Training is offered to the public on a regular basis. We will help you train your dog whether it is pure bred or a mixed breed, large or small. Classes are taught by qualified instructors and are held indoors on Sunday. Mike MacDonald with one of his German Shepherds. Mike's kennels are on Centerville Road - Micurs German Shepherds. Sharon Stevenson and her poodle Minaret's Pandemonium, CGN, CD, got a Rally Advanced Title in Rally Obedience. Marie Fennel showed her two Belgian Shepherds in Rally Trials and got a Rally Novice title on one of them and a Rally Advanced title on the other one. Steve Churney showed his Golden Retriever in Conformation and got Best Pupy in Show on Sunday. Sharon Stevenson showed her new poodle - Ch Kandansk Talk To the Hand CGN, RN in Obedience and "Maggie" got her Companion Dog Title or CD and went High in Trial in all four trials. Maggie also got the award for High Combined Score all Trials and two passes in Rally Advanced.